Life of a Catholic Librarian: Belly Dance Tuesday: "Just make something up. Can you bring your sword?!" 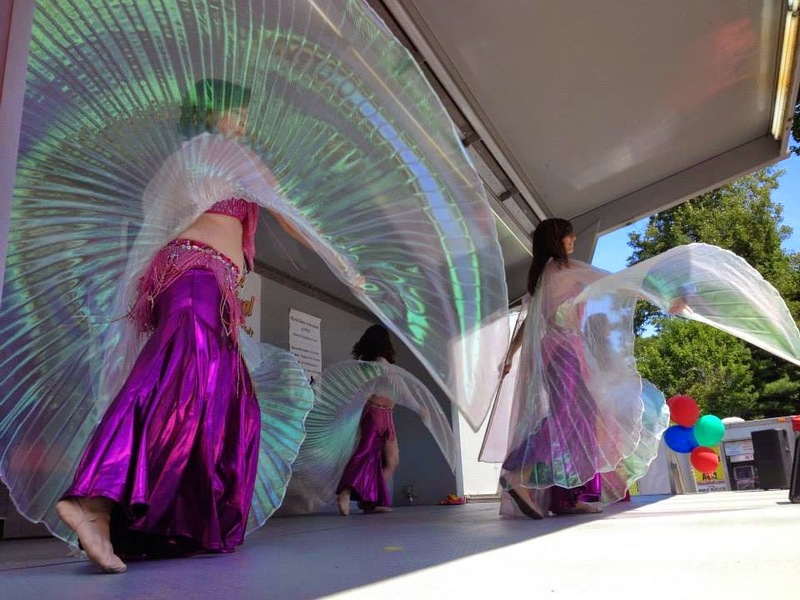 Belly Dance Tuesday: "Just make something up. Can you bring your sword?!" "Do your shoulder shimmies like this, more free form. Less ladylike!" So after all of that, we had to rehearse for this garden gala that we're set to dance in tonight. Turns out, only 3 of us, plus Claire, can make it. This make choreogrphies and formations very difficult, with so few people. But we've been dancing together a long time, and we always find a way to make things work. Our solution? "I'm going to put the music on. Let's see what happens!" She put on a pop song that's been in our repertoire for quite a long time. We had to switch up sides to enter from with just 3 of us, but other than a few minor modifications, it actually worked. Good. We have the new drum piece that would not have worked with 4 people (since Claire joins us for that one), so she put on a previous drum number. Claire calls our memory of this particular piece "Pavlov's Dogs" because she thinks we know it so well we could do it at any time without thinking. And she was right. We all remembered it. Another score. So that's 2 short numbers taken care of. "How long do we have to dance for?" "We have an hour. But that's not happening. Sooooo... as long as we can?" Joy. :0 And we're going to be outside, with chilly weather. "Ok, let's talk about the wings number. Hopefully it won't be windy." Because nobody wants to see the miraculous flying belly dancers. We quickly determined that our wings number would look weird with only 3 people, given the formations we usually have in the choreography. We start out that piece with a tray balancing sequence. Claire suggested we do the tray balance segment, and then just take turns improvising for the rest of the song. "Why don't you each use a different prop. Tiff, can you bring your sword?" With a sword balanced on my head. But I've gotten braver with dance the older I get, so thank God for small favors. We each have about 45-50 seconds to improvise. I know this because I carefully timed the music and divided by the number of people. I'm a Type A freak, no need to belabor. ;-) At first, I thought that given the short time frame, I would just balance the sword on the side and when it was my turn dance out with it already on my head. But I changed my mind. With a sword, dancers *always* balance it while out in the performing space. You can build some nice anticipation that way, and it just looks nicer. Plus, it will eat up a little time. ;-) So that's what I'm going to do. I'm hoping that it goes well. So that's 3 numbers. Claire will do a solo. "We still have a lot of time to work with. Why don't you guys do solos too." So now I'm making up yet more stuff, this time for a full 3 minutes. :0 This involved picking out a song on Claire's iPod that I can improvise to. All by my lonesome, eek. I picked an even tempo instrumental piece that I'm very familiar with. 2 minutes and 58 seconds of anxiety, right there. I do like improvising better than choreographing a piece. I'm more relaxed and I perform better, I know this for a fact, I've seen the videos (yikes! :0 It's always terrible to watch yourself on video, in my opinion). But it's still scary. :) I'll usually plan how I'll enter the stage, an ending pose, and maybe a few accents therein. But otherwise, I just do whatever moves me in that moment. Sometimes, two movements will come into my mind at the same time, collide, and leave me executing a mangled combination of both that resembles Middle Eastern dance only in the most tangential of ways. But I press on. I always feel better about my dancing when I improvise. I feel like I project a more relaxed vibe, which is always good. The emphasis being on *more. * I'm never fully relaxed when up in front of other people, but I do what I can. Soooooo...that's the "plan." :0 I practiced a bit over the weekend, but I don't have a lot of free time at home in order to dance. Plus, my practice studio consists of our kitchen with the microwave as my audience, so conditions are not great.